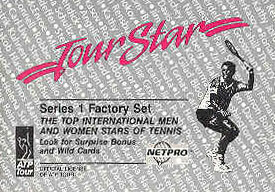 Get the first official licensed set of NETPRO tennis collector cards from 1991. This 100 card set features many of the top pro players from that decade. This set includes the valuable Rookie cards of Pete Sampras, Andre Agassi, Michael Chang and Jim Courier. This limited edition set is a must for every tennis collector and fan. While supplies last.